Tower theater restoration involved improving a severely deteriorated and neglected building. In order to replecate many ornamental surface details, we applied a new technology called Exterior insulation finishing system, which combines stucco with Expanded Poly Styrene EPS foam. This allowed for many 3D visual design improvements in the surfaces. This material not only allows for infinite design possibilities, but can withstand exterior elements. On this project, we integrated color into the plaster materal itself (called integral color), so that no paint or re-painting would be necessary. 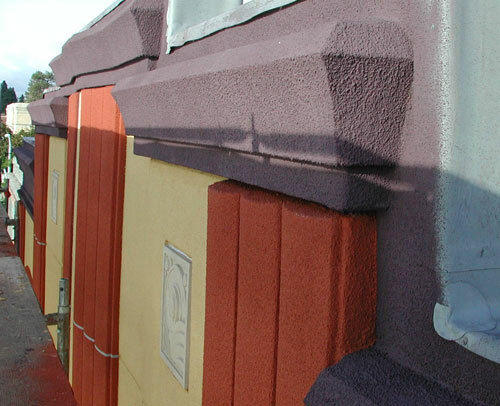 This is a great long-term exterior surface solution as it takes advantage of the durability of the plaster surface. Here you can see the sculptural details that were added to the emulate the 1940s.